The 330 Fair Trade Enterprises that make up the WFTO are themselves an experiment in what business could become if it had a different DNA. That is, if we had businesses that re-oriented themselves to benefit workers, farmers and artisans. These are the enterprises that make and trade everything from clothing and coffee to bananas and bags. Spread across over 70 countries, they were born as an alternative to a mainstream business model fixated on maximising and extracting profits. This is the vision that is showcasing there is a better way. Poverty in a world of plenty is hard to stomach. But sadly, hundreds of millions of people across the world are trapped in extreme poverty. And last year, the number of people going hungry rose to 821 million. The world economy is failing too many. The last few years has seen economic growth and booming corporate profits. But this has not benefited everyone. Inequality has spiralled to extremes, where the richest 1 percent now own as much as 99 percent of the world population. While billionaire wealth has gone up, wages and incomes have stagnated. Something is wrong when farmers and workers are not getting their fair share of the fruits of their labours. According to global experts, if we want to tackle poverty, we must include a focus on inequality. For instance, the World Bank tells us that unless we tackle inequality, we will still have half a billion people trapped in extreme poverty by 2030. So where do we look for inspiration to reshape business and trade if we are to end poverty? Think for instance of Township Patterns in South Africa, a network of women’s producer cooperatives, or Dr Bronner’s in the US, which is sharing its profits to pursue its social mission. Or think of Corr the Juteworks in Bangladesh being governed by representatives of workers and producers, or the multi-stakeholder ownership and governance model of El Puente in Germany. These are truly unique models that have engineered their business to prioritise social impact. These idea goes back decades. In 1989, the WFTO began as a community of alternative businesses. Our community of Fair Trade Enterprises continue to pioneer new ways of shaping business and trade so it puts people and planet first. These are the businesses that bring into the heart of business a focus on inequality and poverty. As WFTO members, Fair Trade Enterprises are peer reviewed and audited on three fronts. Firstly, they are verified social conditions that uphold human rights, and create positive social impact. Secondly, they adopt trading practices that ensure such conditions are met, through verifying payment terms and longevity of trading relationships, which we know can make or break attempts to improve conditions for workers, farmers and artisans. Thirdly, they have embraced the mission of Fair Trade through their structures, such as their board, governing documents and profit model – ensuring their business is set up to drive the right trading relationships and ultimately empowering workers, farmers and artisans. 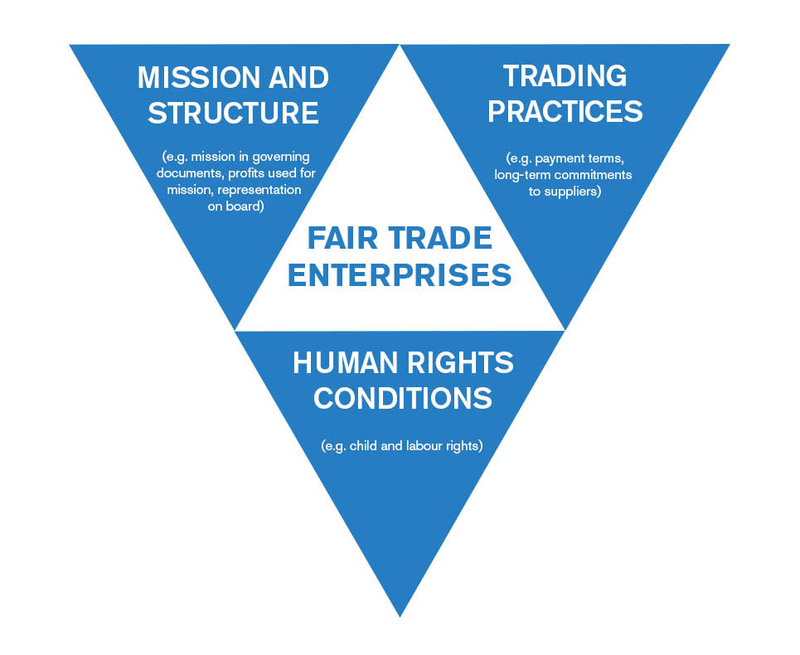 This triangulation helps select which businesses can be viewed as Fair Trade Enterprises that are truly pioneering models of business that put people and planet first. Today, as a part of anti-poverty week, we release new figures about Fair Trade Enterprises. We assessed WFTO members to see how this alternative mode of business is faring. We found that 965,000 people benefit from these enterprises as workers, farmers and artisans. 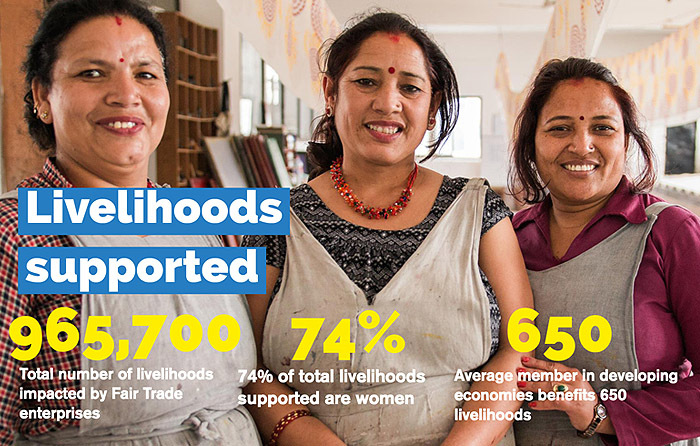 And 74% of livelihoods impacted are those of women. Download WFTO Factsheet. Fair Trade Enterprises are a real alternative and they are having real impact. 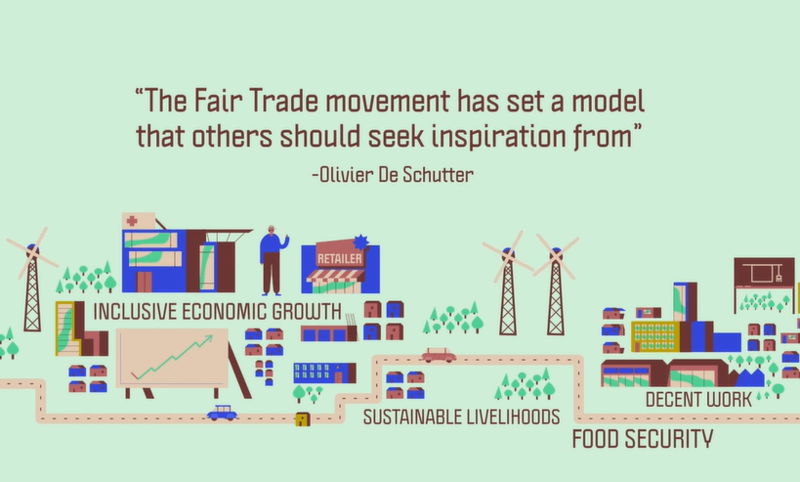 In the words of the former UN special rapporteur on the right to food, Olivier de Schutter: “The Fair Trade movement has set a model that others should seek inspiration from”. We hope the models of success from across our movement do just this.